How much does it cost to travel to Estonia? How much money will you need in Estonia? €62 ($69) is the average daily price for traveling in Estonia. The average price of food for one day is €15 ($17). The average price of a hotel for a couple is €70 ($78). Additional pricing is in the table below. These average travel prices have been collected from other travelers to help you plan your own travel budget. How much money do I need for Estonia? Estonia is a quaint and charming country that has evolved dramatically from the days when it was occupied by the Soviet Union. It's a wonderful example of the economic, cultural, and political development that can evolve after such a dramatic history. Today this country is a peaceful and proud member of the European Union. Estonia is also becoming a new hotspot for travelers in Europe. Picturesque Tallinn is the most commonly visited city, but don't miss a visit to the island of Saaremaa. The island takes up about one third of the country's land mass and a visit is like stepping back in time. The island is dotted with old churches and windmills and the towns feel untouched by the last decade's development. You'll have to rent a car to truly explore the area as public transportation is sorely lacking, but it is well worth the expense to wander the island freely. Many people head to Estonia for the cheap drinks, loud parties, and late night activities, but there's so much more to this country. The cities come to life with a youthful vibe, but the rural countryside holds tight to the traditional way of life. Estonia is still a budget travel destination in Europe, but things are slowly changing. The best time to find good deals is during the shoulder seasons of spring and fall. The weather is cool and crisp, but the hotels and restaurants are open and eager for business. If you're visiting during the cold and bleak winter months, you'll find many places have shut down for the season. Transportation in the country is generally cheap, particularly if you use the local buses almost exclusively. Some more rural areas require a car, but rental cars are surprisingly affordable as well. They are almost always manual, so do not expect to be able to rent an automatic. The most affordable food option in Estonia, particularly in Tallinn, is the cafeteria style dumpling restaurants. You can fill your bowl with any number of dumplings and sauce and then pay for your food by the weight. These are particularly popular with the student populations. Less common, but also good, are the pancake options. Similar in style, you load your pancakes high with any number of sweet or savory toppings and enjoy a filling and satisfying meal at a low cost. Estonia is a small country and it is, therefore, very easy to get around. For the most part it is easily accessible by public bus. There are several exceptions however, particularly on the island of Saaremaa which requires a car to fully explore. Although the city of Tallinn is most people's destination of choice, there are a surprisingly high number of places to go hiking throughout the country. Estonians love to be outdoors and you can see this in the large number of places set up to take advantage of the few warm months. Spend a few days in the city and then head to the countryside where you'll see impressive landscape and fun outdoor activities. Rural areas are also much cheaper to visit than the more popular cities. Extreme swinging, or kiiking, is a popular activity throughout the country. You'll find swings set up in the countryside that are of all shapes and sizes. There are tall swings, large swings, and more. It's fun to try your hand at it while you're in the area. It adds to the light and playful nature that is common throughout this young country. Internet access is widely available throughout the country. It's available in many public places including petrol stations, the public library and in some parks. It's also available in most hotels you'll stay in so if you have your own laptop, you won't have trouble staying connected. Estonia hosts some wonderful festivals. Music is popular and you'll find many great places to hear a good band. Many festivals also embrace the folk heritage of the area and are a fun way to explore some of the culture. Old Town Tallinn: Old Town Tallinn is an absolutely beautiful glimpse into the history in Eastern Europe. It has preserved cobblestone streets and wonderful examples of regional architecture. You can easily spend a couple of days exploring the area. It's also known for its late night parties and bar atmosphere, which is part of the appeal for many of the younger travelers. 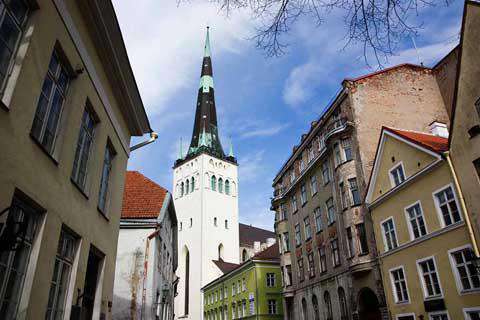 If you're visiting Tallinn, you'll find your experience much more rewarding if you find accommodation that is located inside of the old town. Estonian Open Air Museum: Just eight kilometers outside of Tallin, this is one of the best open air museums in Europe. It is the recreation of an old Estonian village and has a working farm, shops, a fire station and examples of over sixty eight different homes. It's a great place to explore if you're interested in the regions history and daily lifestyle. Kadriorg Palace: Located in Tallinn, the Kadriorg Palace is a beautiful palace on lovely grounds. Its construction began in 1718 under the rein of Peter and Catherine. You can take an English tour of the building and see the impressive art collection inside. Estonian food is heavily influenced by its nearby neighbors. In particularly, you'll notice German and Scandinavian trends in your Baltic dishes. The cuisine is also comparable to Russian food as it is bothy heavy and rich in meats and sauces. Rosolje: This is a traditional Estonian dish that is made from beetroot, meat, and herring. Rosolje is essentially a beet salad. It is served cold and is a nice accompaniment to most meals. Pirukad: This is a dumpling like dish that is filled with meat, cabbage, carrots, or rice and is usually served with bouillon. It's the Estonian answer to the Polish pierogi and you'll find it available at most casual restaurants. Raim: This traditional Estonian dish is quite popular throughout the country. It's made from Baltic dwarf herring and is usually marinated in a sour cream based sauce, giving it a very rich flavor. Estonia feels like a European country frozen in time. The city centers are quaint and beautifully historic. The rural areas have managed to maintain their rustic charm. The island of Saaremaa, which takes up about a third of the countries land mass, feels completely untouched by modern development. Throughout the country you can visit quaint local churches. There are windmills that are still integrated into the culture and society. They are far more than a tourist attraction. The country's fascination with swinging, while it seems a little odd, is the perfect example of the fun loving and friendly personality of the people who live here. Estonia may not yet be Europe's top travel destination, and it's that reason that makes it so appealing.